How things have changed from the first beta run of my online course from my most recent launch full-blown video bootcamp.The audience changed, my process definitely changed, but one thing always remained constant, which I believe was the key to it’s success in both runs. Now get prepared for full transparency here. I’m going to be revealing my most important actions, my numbers and everything in between. If you haven’t watched Part 1 yet, you should check that out FIRST so this all makes much more sense. In this video, I’ll share how my second launch was dramatically different, what I did wrong, and what’s in store for the future of Craft to Camera. In the process of building my own online course, and working with clients who are doing the same. I’ve seen all different approaches. Depending on your niche and industry, there’s no right or wrong way to build and launch, but there are certainly some key concepts that you need to be thinking about that will help you to position and plan your course that has a direct relationship with how well it sells. In the last video, I left off where I had just wrapped up 8 weeks of live training with the beta members of Craft to Camera. I was exhausted, but I knew that I had delivered tremendous value and there was PROOF by seeing the videos that the members had created. So in planning this second launch in the summer of 2015, I knew that I wanted to attract a bigger audience and get even bigger results for the members. But the key to actually getting much faster traction in this launch, I believe, were attributed to two things: knowing how to smartly use Facebook Ads for the first time, and people finally knew who I was so it was easier to reach more people and get them to opt in to my free training. I set a launch date for early July and started updating my launch videos and newsletter content in early June. Now, this is where I made a huge mistake. I had kept the same content as in my beta launch, which were essentially portions of the course content. Here’s the thing: when I started this whole thing, I had no intentions of turning into an online course. I just wanted to a killer opt in that could take the user from start to finish. BUT as a launch sequence, you want to show people the WHY and the WHAT, but not the HOW. I guess because the beta series had done so well, I somehow thought “why fix what’s not broken”? I started running Facebook ads to my 4 part video bootcamp about one week before the start date, and it immediately got attention. I split tested image ads vs video ads, but I didn’t really have to. They were both converting really well. THE TRIFECTA: YOUR EXPOSURE, YOUR OFFER & YOUR AUDIENCE. If you remember from part 1, I launched to a list of only 60 people, but my offer converted really well because I was really engaged with them. But it was just such a struggle to get my offer in front of more eyes because A) no one knew who the heck I was, and B) I didn’t use anything other than my organic reach to advertise my free training. The success of your online course depends on a happy intersection of three things that I call the Trifecta: your Reach, the need for your Offer, and your Audience’s inclination to purchase. Now, you can reach more people with Facebook ads, but if there’s no need for your offer, or your audience doesn’t feel compelled to invest in it (or you just yet because they don’t know you), then your trifecta needs to be tweaked. Remember that the longer you’re in the game, the more exposure you’ll get too. So if it’s your first time launching, please don’t get too attached to the outcome of your first launch. Focus on getting quality feedback so you can launch successfully again in the future. And expect to make some tweaks to your course! So here’s where my trifecta went wrong. I had my exposure, my audience was eating up the free training and there was tons of new engagement in my Facebook group, but when it came time to reveal the offer. Crickets. POSITIONING OF VALUE & ABILITY TO PIVOT. I had structured the course just like I did for the beta with 8 weeks of live training and Google Hangouts where I could provide more interaction and feedback. But I also knew that for that live component, I had to charge appropriately for the value that I could deliver. It was that component of the course that, even though it was a lot of energy, I really wanted to keep because everyone’s video project was different, and this gave me the ability to really be creative and responsive with the member’s projects. But when I opened the carts at $847, I got no response. “It’s okay, just give it a little more time” .. 24 hours later still nothing. Instead of freaking out, which I still did, I knew I needed to figure out what the heck was going on and find a solution. FAST. It wasn’t the bootcamp, there was clearly a need for video training and there was tons of engagement. Something prevented people from taking the next step. It must’ve been the structure or the pricing. Ah, and another thing, because I had kept the launch content more or less the same, it didn’t make sense for people to purchase at that price when they already had the tools to move forward. So, as much as I wanted to keep the live component, I dropped it from the package, lowered the price to $347, and told my list to join me for a webinar. Even before the webinar started, the sales started coming in. I also later learned that the weekly Google Hangouts, which I thought were a huge asset to the course, was actually holding people back from buying because they didn’t know if they’d be able to show up live. Just goes to show, you can never assume. Even with this lowered price point, I made over $12,000 in less than a week, and I know that it’s only going to go up from here. THE FUTURE OF CRAFT TO CAMERA. I actually kind of enjoy launching. With a background in film production, my whole life has been prepping for an event to launch it, then wrapping it up, so there’s something about this tempo that excites and motivates me. But, it’s not for everyone, and for it to truly be a source of passive income, why would I shut people out from buying it if they want to? 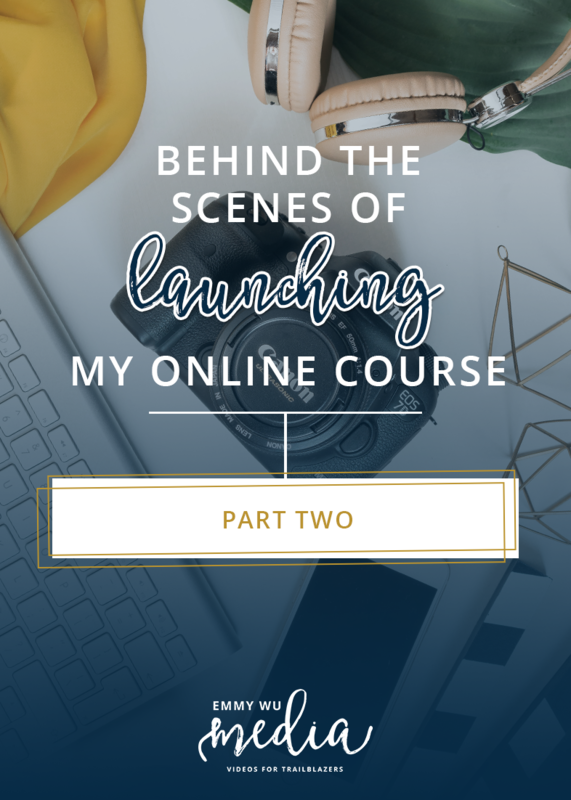 Over the course of this last year, I’ve learned so much more about marketing and positioning to sell, I’ve become a better teacher and I’ve learned that I truly have a fascination with launch funnels. In the winter of 2015, I’ll be writing and creating an entirely new launch series for Craft to Camera and applying what I’ve learned and using tools to make it an evergreen funnel, while still launching twice a year for increased exposure. What’s even more exciting, is that I plan on updating the content of Craft to Camera with new marketing strategies and techniques that I know will surpass even my original plans for this course. Take aways: it’s a TON of work launching an online course and it’s really not passive income at all. You have to put a lot of heart and energy in surveying, scouting, asking, building, tweaking and sometimes a little crying to make sure that what you’re delivering is truly aligned with what your market is looking for and willing to pay money for that solution. If I would’ve done anything differently, maybe it would’ve been wise to wait a little longer instead of rushing to give birth to it. But then again, I’ve never been the patient type and the flow of events unraveled in a way that always pushed me to keep moving forward with this program. I’m going to invest time in updating the content and in the eyes of the creator, it might never be perfect, but that’s also all part of the journey so be prepared for it, and embrace it.